Learn about Mackinac history from Robert E. Benjamin whose family roots on the island date back to 1885. Bob's books feature his own photos taken since 1940 as well as earlier photos in the family's extensive collection. 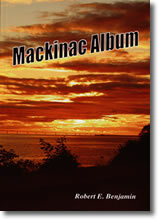 Published in 2008, the newest Benjamin book Mackinac Album, includes 160 pages of pictures of Mackinac in past years and of Mackinac today. Interesting and informative, Mackinac Album, is a must-have book for those who enjoy visiting or living on Mackinac Island. 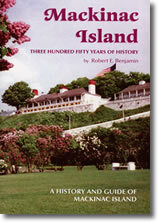 The book's photos show the beauty and historic significance of the island that contributes to its charm. This guide to the history of Mackinac Island will increase any visitor's enjoyment of this beautiful and historic island. This chronological account of the significant events in the island's history is illustrated by fascinating photos both current and historical. A special section of the book serves as a walking or biking guide for the visitor. Also included are suggestions for finding the perfect locations for your own Mackinac photos and for activities to maximize your enjoyment of the island.